When things were going extremely well for Geez magazine in 2007, its banner year, subscriptions shot up to 2,000. Readers were so in love with the cheeky, contrarian “post-Christian” quarterly that many were paying more than the annual $35 subscription to ensure its survival. One subscriber has sent the magazine $100 a month since 2008. You’d think that an editor would be on his knees in gratitude to this donor, since the Winnipeg-based magazine does not accept ads and funding is usually difficult. The donor, a Canadian living in the U.S., explained he had not connected with a local church and his gift to Geez was a way of paying his dues. “The magazine became his church,” Enns says. Which seems odd given that Geez’s mission statement says it reaches out to the “over-churched, out-churched, un-churched and maybe even the un-churchable.” In other words, it’s not for the pious, the blindly faithful or those seeking tepid consolation. There’s a regular feature called Sinner’s Corner, in which readers look for guidance in their ethical struggles, as in: can an environmentalist play golf in good conscience? A recent issue looked at body image and discrimination against fat people; another reported on 30 sermons that would never be heard in church. More recently, a two-page spread focused on “police brutality” at the G20 summit. McGill professor Darin Barney says the magazine is one of the “smartest kind of progressive, critical, lefty magazines” in Canada, with roots that reach back to the Depression-era social gospel movement of the prairies. “It fulfills the critical mission perfectly,” says Barney, the Canada Research Chair in Technology and Citizenship. “Often the first target of criticism is itself — not as a magazine, but as critical Christian writers, they turn their questioning ethic most vigorously on their own faith and their own practices. “Not as a way of tearing these down, but interrogating them in a productive, fruitful and progressive way. Thinking about what could be, Enns, founder of Buy Nothing Christmas, started Geez in 2005. The magazine has been removed from church library shelves, but it has also earned praise, including an UTNE Independent Press Award for best spiritual coverage in 2009 (it had been nominated four times), prizes for general excellence and socially conscious religious journalism from the Canadian Church Press, and the 2007 award for western Canada magazine of the year. Still, the editors have managed to bring some critics into the fold. When a California-based Christian ministry criticized Geez on radio, the host of “The Way of the Master” program was invited to write for the magazine. Todd Friel’s piece was called “Top 10 reasons Geez gets up my nose.” His criticisms ranged from its per-issue cost — “I could buy three gallons of gas for my SUV for $7” to the magazine’s failure to fully understand the gospel. “The efforts of Geez will result in a loving planet that looks great while people go to hell,” Friel concluded. 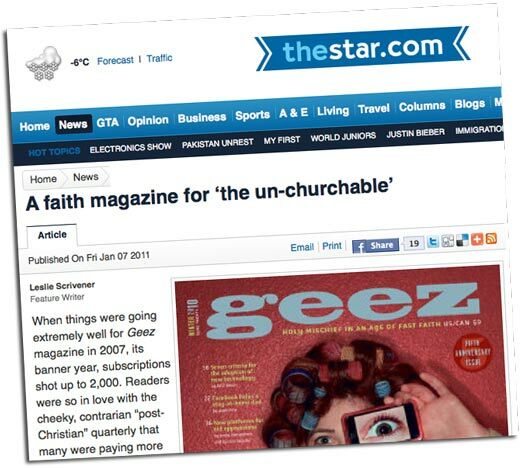 Geez, which recently marked its fifth anniversary and has managed to stay out of debt, now has a subscriber list of about 1,300 and a print run of about 3,500 (by comparison, The United Church Observer — which has praised Geez — has 55,000 subscribers). Independently run and non-denominational, Geez, does not receive support from any church. It’s put together by five part-time staff who earn $12 an hour and volunteers, all working in the back of a choir rehearsal space at Winnipeg’s Knox United Church. Between teaching journalism and his work at Geez, Enns, who is married, brings in a yearly salary of about $12,000.